As you see, I am finding it is hard to photograph doilies. Well more exactly, it is a challenge to take a photograph that is interesting as a photograph while still showing the doily’s stitches. 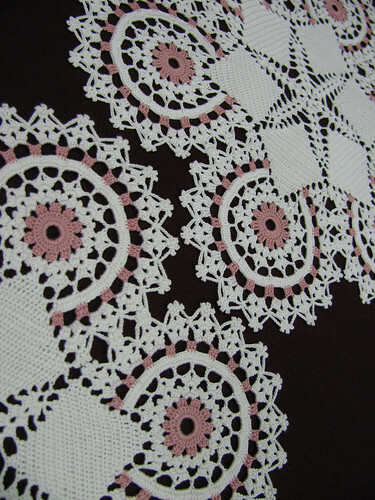 I made these two little (10″) doilies from an old issue of “Decorative Crochet”. It is the cover design. I didn’t like the pattern once I started it. It called for spiraling rather than doing the pink and white design in the round. I changed that and made the triangle shapes in the original doily into diamonds. I think the design works better this way. Another aspect of the of changing the design is that I worked the center after the petals and from the outside, finishing in the center. To see a single doily in it’s entirety click on the image. Two other photos are on my flickr photostream. I like to make small doilies as pairs. They just stand out more that way. This entry was posted on Saturday, November 8th, 2008 at 3:00 am and is filed under Crochet and Lace. Tagged: Crochet, Doily, Thread. You can feed this entry. You can leave a response, or trackback from your own site.